Congratulations to Jonny Sheets, a senior at Ann Sobrato High School. 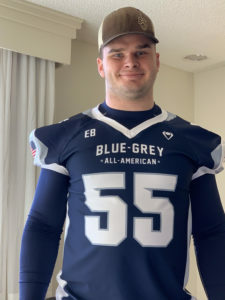 He played defensive end in the Blue-Grey All-American Bowl in Houston Jan. 14, Morgan Hill Unified School District Superintendent Steve Betando told us. Sheets is the first player from Morgan Hill to ever go to the All-American Bowl. He played for “Team 49,” which represents all states except Texas, which has its own team. The roster consists of the nation’s top prospects in the Class of 2019. Out of 6,800 athletes, 60 were chosen for the tournament — and 90 percent who participate receive scholarships. Team 49 was up 10-0 at the half. Unfortunately after halftime, Team Lone Star (Texas) turned it on and ended up winning 29-10 score. There’s a new face leading the Santa Clara Valley Water District Board of Directors. Officials have chosen Linda J. LeZotte to serve as the 2019 chair of the board. The unanimous vote Tuesday, Jan. 8, launches her second tenure as board chair, the first one occurring in 2012. LeZotte takes the helm at a time when the agency has $205.1 million in capital projects — out of a $509.9 million total budget — including flood protection projects along a variety of creeks throughout Santa Clara County, as well as the maintenance and repair of aging infrastructure, including the retrofit of Anderson Dam, its largest capital project ever. “It is an honor and a privilege to be elected by the board of directors,” LeZotte said. Feb. 2 is not only Groundhog Day. It’s World Play Your Ukulele Day when all ukulele players are encouraged to play their instruments. Events have been planned in Gilroy and Morgan Hill to celebrate World Play Your Ukulele Day, our friend Linda Tarvin told us. The Gilroy Ukulele Jam will be playing from 8:30 to 10 a.m. at Café 152 Bread Company. The songbook they will play is available on their website, www.GilroyUkuleleJam.com. Morgan Hill Lukes (Library Ukulele Society) will play from 1:30 to 2:30 p.m. at the Third Street Plaza. The group will play the same songbook as the Gilroy Ukulele Jam. For more information, contact Susan Patereau, susan.patereau@gmail.com or call (408) 981-2799. Thanks to Aileen Teren-Foster, many house-bound seniors can get out and do their shopping and other chores. And the Parks and Recreation Commission recognized the Morgan Hill resident and volunteer for her commitment to the Get’n Around Town program at its Jan. 15 commission meeting. It’s a volunteer driver program that pairs older adults in Morgan Hill with volunteer drivers to assist them with transportation to appointments, run errands, or get groceries. Aileen has dedicated more than 155 hours and has driven 548 miles since it began in October 2017. “I hate to leave anyone stranded and I never want anyone to be a shut-in,” she said. For details about the program or other ways to get involved, visit www.morgan-hill.ca.gov/1610/Volunteer-Opportunities or call (408) 310.4258. Congratulations to Catherine Le. The drum major from Ann Sobrato High School was one of more than 300 high school dancers, cheerleaders and drum majors from across America who performed in Rome New Year’s Day. Those invited to perform in the celebration are part of the All-American program, selected from Universal Dance Association, National Dance Alliance and United Spirit Association at summer camps across the country. All-Americans are chosen based on superior athletic and leadership skills. Only the top 12 percent of athletes who attend camp earn the chance to perform in the holiday spectacular. “Our talented cheerleaders, dancers and drum majors really enjoy the opportunity to show their skills to a very enthusiastic international audience,” said Mike Fultz, international event coordinator for Varsity Spirit.